A new feature at 23andMe is the ability to link your DNA test profile to a tree at any one of a number of online sites. Ancestry.com, FamilySearch.org FindMyPast.com, GENI.com, MyHeritage.com, RootsWeb, and WikiTree.com are all supported. The problem is that most of those sites need a login so if your match is not logged in there, it does not work well. WikiTree.com and RootsWeb are the two that do not need a user to be logged in to see the tree, so I recommend using one of those sites. Although MyHeritage.com, which many of us still have from the days when you got a free small tree there as a member of 23andMe, will show much of a tree without being logged in. Where do you see this tree link? Go to Tools > DNA relatives and click on a person. Scroll to the very bottom of the page and see something like this image. Click the ‘Visit” link to get to the tree. How do you link your profile to your tree? This is the tricky part. The only place I have found where you can do this is from your DNA relatives People page. UPDATED 25 jun 2018: On the top right of the page under your name and image it says “Manage Preferences” as shown in the image below. Click those words. On the next page, scroll to the very bottom and look for the words Family Tree URL, as in this image (with my usual added red arrow). Click the tiny down arrow (indicated by my red arrow) to the right of those words to get that box to expand. Now you will see some more words like “Share your family tree with your DNA Relatives. See the list of supported family tree services.” Click the little “i” if you want to see the list. 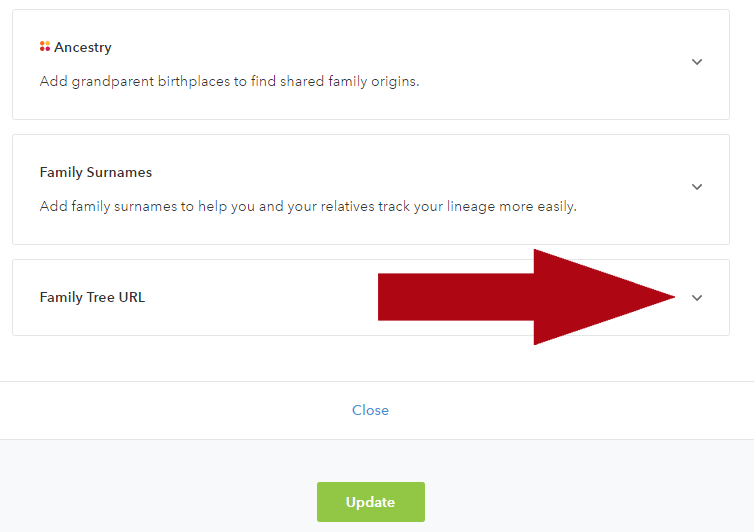 There is a box below those words which will either be empty or have a MyHeritage URL, if you originally set up a tree there. If you wish to change it, delete that URL or double click on it. Then add or paste in the new URL for your preferred online tree. Finally click the UPDATE button. WARNING, at least in chrome, a box comes up asking if you really want to leave this page. NO you do not want to leave until the swirling “Saving Preferences” goes away! The pedigree view in your online tree is the most useful for people looking for shared great (great great) grandparents with you. 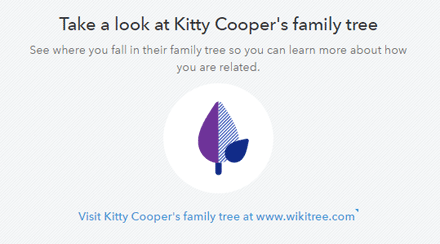 I prefer to use WikiTree.com which has both a pretty pedigree view and a compact one. Clicking through to my tree gets you to this page where you can easily see where we might match and where my 2nd grandparents are from if it is further back. 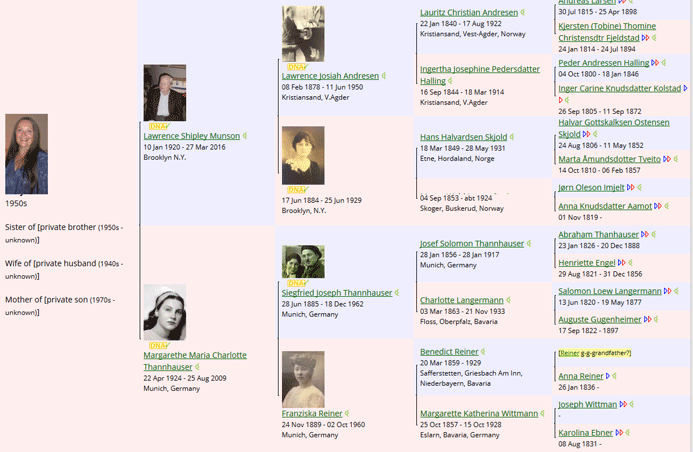 And scrolling down that page there is a link to a compact tree which shows up to 254 ancestors with dates, places, and ahnentafel numbering. Click here for mine. By the way, if you have not been on 23andMe for a while it will ask you questions about viewing your health reports before it lets you do anything (unless you are an ancestry only member). I look forward to seeing more trees linked to my matches at 23andMe! UPDATE 2 May 2017: I forgot to mention that your tree must be set to public at WIKItree for this to work. You can keep your details private while your tree is public see my recent blog post for how to do that. 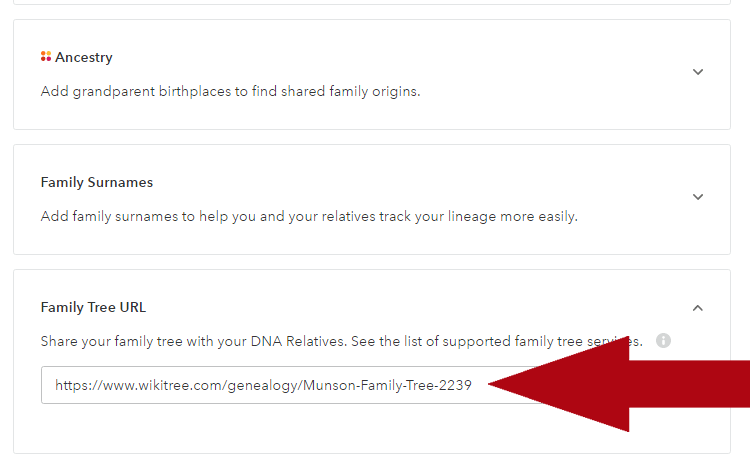 Using https://www.wikitree.com/treewidget/Munson-2239/5 instead will let your matching relatives see your 8 generation compact tree and is a quicker way for them to find your shared ancestry. I recently added Wikitree tree links for 23andme accounts and I have heard from new matches. It’s great because the inquiries were specific questions that solved some mysteries. I’ve seen posts that suggest some people don’t know how to capture the URL for a specific person in their pedigree at these sites. It might be slightly different for each of the alternative sites, but I think the generic advice would be to copy the URL in the browser address bar when the person of interest is showing (preferably in a pedigree view). Ann, thanks for that additional tip! It’s a shame that 23andMe doesn’t allow the link to be added for more than one (or all) of the “designated” trees. My Ancestry tree is by far the most complete, but requires a subscription, whereas at the moment I only have small trees on Wikitree and FamilySearch (and I will never have time to add all the collateral to those sites as well as maintaining my primary Ancestry tree). Although these links can be added to the Profile as a workaround, I would prefer them all to be together in the tree block. Ask Kitty to talk about her methodology for synching all her trees – I want to hear more too! When I get some time I am going to create my own webpage with links to my trees on wikitree, gni, MyHeritage and Ancestry and use that URL. Then someone matching can take their pick and I can use both versions of the wikitree experience. Well, after I beefed up this page: http://texsys.com/MaxAnnen.html and tried to enter it on 23andMe, it said is was not a supported page… What do you think of that page – too busy – or is there such a things as TMI in our genealogical pursuit? This is a great tool for people on 23andMe who have been transitioned to the “new experience” but for those of us still on the old site… it is something else to be bitter about. While WikiTree may be great for beginners, I’ve been at it a while, and my database contains over 51,000 individuals. WikiTree wont’ accept my GEDCOM, and I’ve spent too much time gathering that data to try to figure out how to create a meaningful subset. RootsWeb remains the superior albeit kinda 1990s-clunky genealogical hosting site. 51,000 is a lot but RootMagic Essentials makes it pretty self-selecting for small subsets to be split off, and those small subsets are convenient for investing small chunks of time managing the imported individuals post-import, in my admittedly smaller gedcom import experience – that’s where the power of collaboration comes in. It’s also a friendly and flexible site with a lot of smart people and fun community collaboration, challenges and responsiveness. Linking to your RootsWeb tree is fine as I say in the article but frankly I completely disagree about your statement re WIKItree. No need to import all 51,000 as probably some 40,000+ are already there. Remember wikitree is a collaborative tree, one copy of each profile … It is SO useful for DNA that I really recommend uploading a GEDcom of 8 generations of ancestors and putting in kit numbers there. Also see my comment above with a link to my article about keeping multiple trees updated. Much of your earlier ancestry is already in WikiTree. You simply need to connect what you have (which is not in WikiTree) to that earlier ancestry. Thanks for the serendipitous tip. Was just mulling over last night how to make more use of a cousins old 23andMe test which isn’t supported at FTDNA or dnagedcom [without windows client]. Yes, that’s the one connector thank goodness. I was able to link my tree on Wikitree to my profile, but when I follow what you say in “Where do you see this tree link?” I do not see what you see. There is no display that says “Visit Vernon Smith’s family tree at http://www.wikitree.com“. 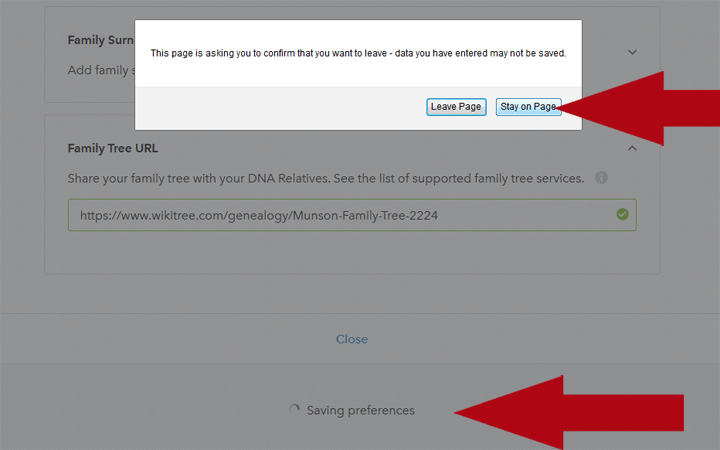 You have to be logged into a different person to see the link to your tree at the very bottom of the page when they click on your name in DNA relatives. Hmmm, I really need to check on how this works with multiple family members under one login. Thanks, Kitty. Now I understand. I do not have access to another account that has me as a relative, so I will just have to assume that it is working. I really enjoy your posts. Thanks for the compliment Vernon! You inspired me to change the URL in my two aunts who are together and I am happy to report that worked fine! Thanks Kitty! I do love WikiTree, though I am slow on the learning curve. They have added so much! I am awed by their little elves. I am always finding additional sourcing to family profiles. I like that they have automatic links to Gedmatch Tier 1. When you find DNA triangulation on Wiki to “prove” your paper trail it gives me goose bumps. Their G2G forum is amazing with the help they give. I need all the help I can get. Done! Very cool and thanks for the tip! Thanks, Kitty. I have now linked my wikitree to 23 and Me. Unfortunately the 23andMe page of DNA relatives is different (Ireland) and whilst it has an Update Profile link there is nowhere to add a link to a family tree. Perhaps you should amend your article to show that this is for US customers only (?) as us poorer European cousins don’t appear to have this facility yet. I think they have disabled this. 🙁 I don’t see anything like you describe. It is still there, just not many people know about it and so they do not set it up for their profile. Hopefully you will be one of the ones who does link a tree! The tree at 23andme is just a link to whichever tree you set it to, so the rules of that site apply. No worries about the living. How effective will this be if you do not know who you’re biological father is. I am coming late to this particular concept and went today to try to link a tree to my 23andme file. The link you mention in your post from last year isnot showing up, at least not for me, on the DNA relatives page. Has 23andme moved the tree link feature, or taken it down? Thanks for all you do for the genetic genealogy community. OK I updated the article. Thanks again Sara! When you post a public link, what is divulged about the people on that link? I have not looked at what is requested. I use 23 and want to build a family tree which they don’t offer. Is there a recommended tree site? All the sites that show trees keep the living private. WIKItree has the best privacy controls and does not require a login for your cousins to look at the tree so that is the one I recommend. Plus if you put your GENESIS or GEDMATCH kit number in then your tree will be linked to from your DNA results at GEDmatch. On the other hand if you have Norwegians or Jewish ancestors the GENI tree may already have them so might be better.